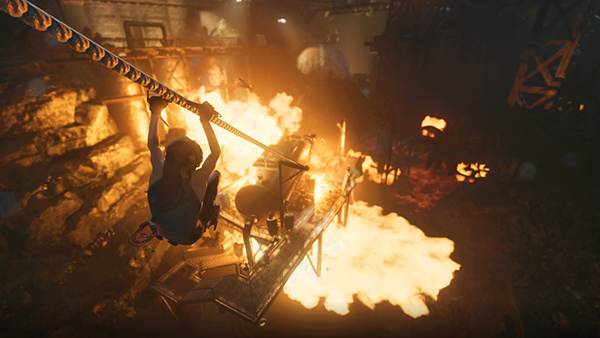 During the cutscene, Lara jumps onto a zip line and slides down as a huge explosion erupts below. 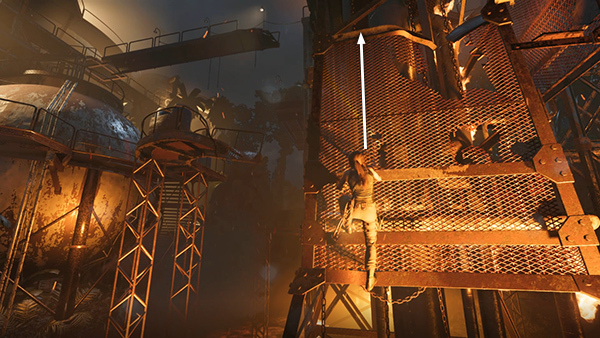 ...jump off the edge, and grapple a metal bar on the tower ahead. 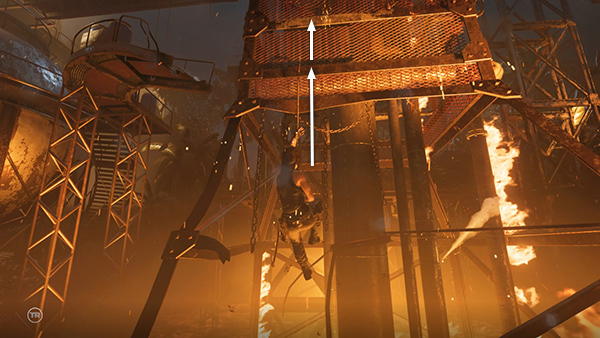 Climb the cable until you can grab onto the bar. Then continue climbing to the handhold above. 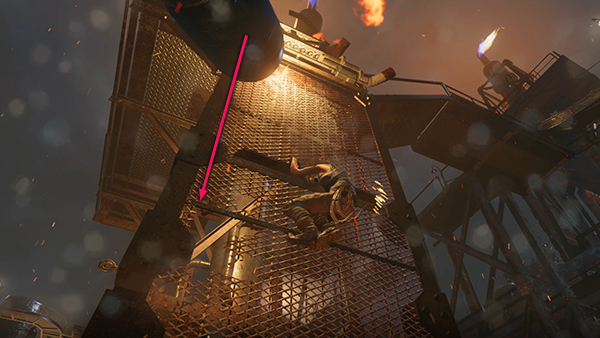 Scramble up the grating to grab the twisted metal bar. 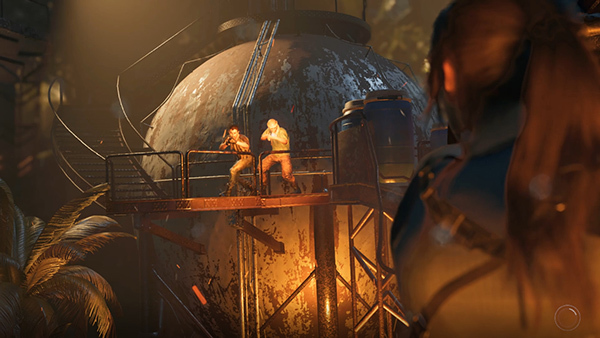 In a brief cutaway, a couple of mercenaries appear on a platform to the left and begin shooting at Lara. 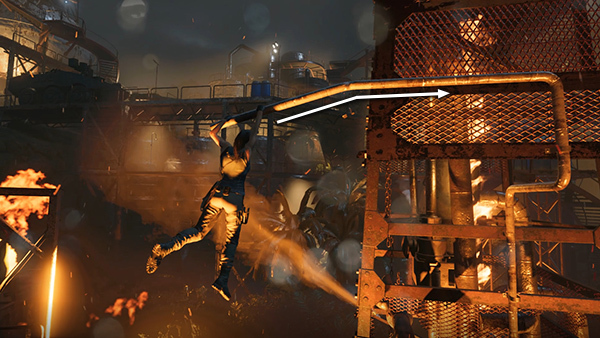 ...which then bends alarmingly, swinging Lara around so she's hanging in midair. Traverse along the pipe to the right before it snaps off. 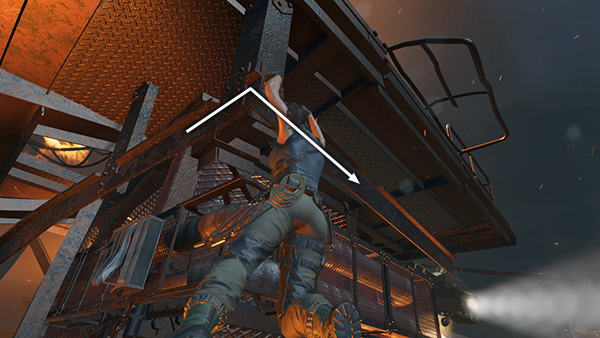 Climb to the handhold above, then scramble up the grating to grab the next horizontal bar. 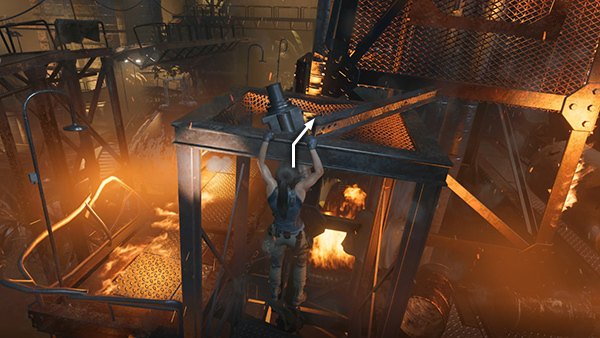 Pause here briefly as a barrel falls past. You don't need to do anything except stop near the middle of the bar. 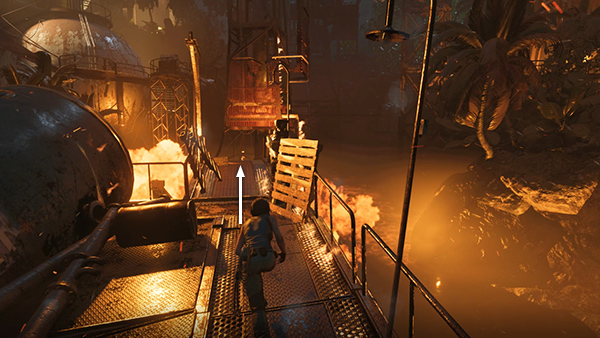 Lara ducks automatically. 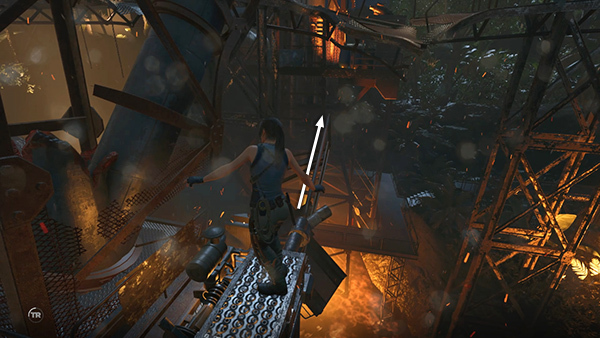 Scramble up to the next higher handhold, then climb onto the ledge above. 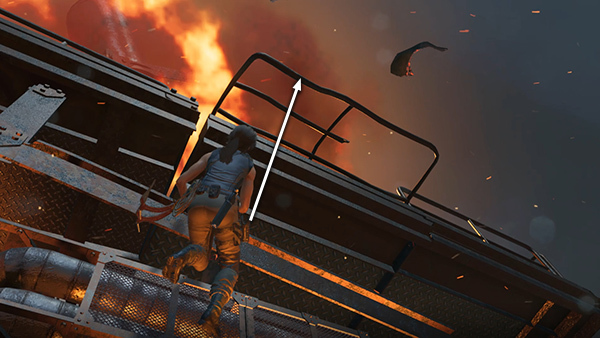 As you do, a chunk of falling debris destroys the catwalk on the right. No worries! 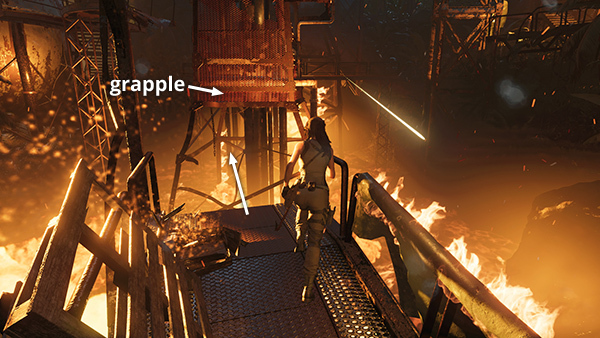 Lara's been training for this since she was nine! Turn right and walk out onto the narrow bit of railing. 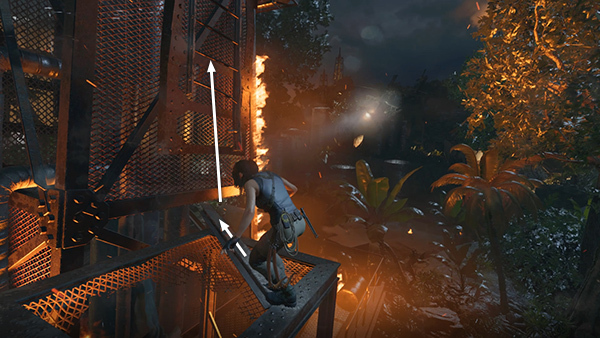 When you reach the end, jump forward to grab the broken catwalk. 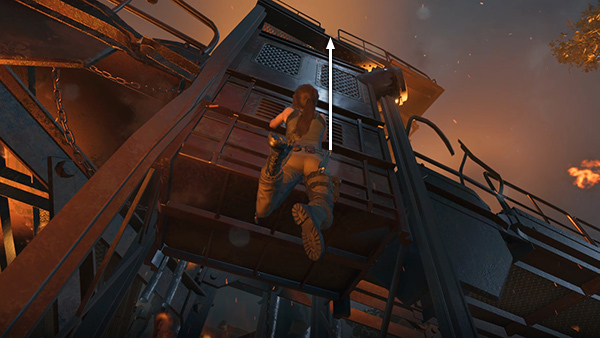 It swings forward flinging Lara into the air so she grabs the ledge ahead. More barrels tumble down nearby, but they aren't an actual hazard, just another bit of set dressing to ratchet up the tension. 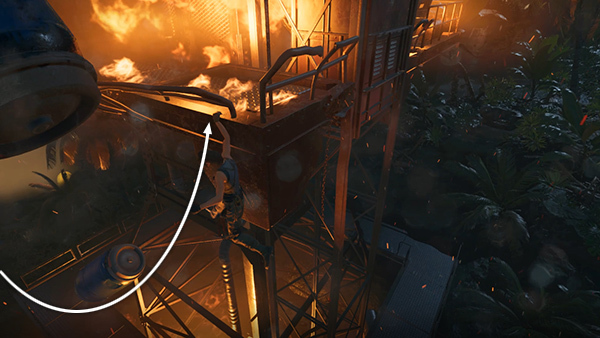 Climb around the corner to the right. 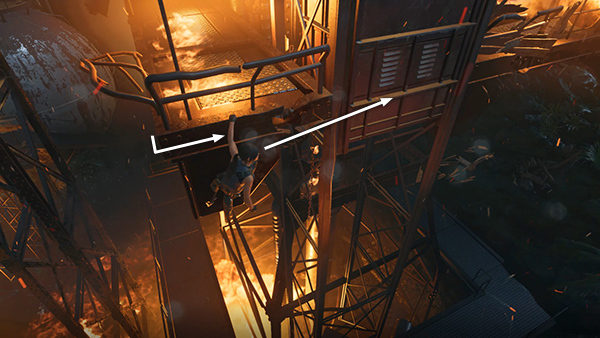 Then jump to the right to grab a handhold on the back of what looks like an elevator car. Climb/scramble up as high as you can. 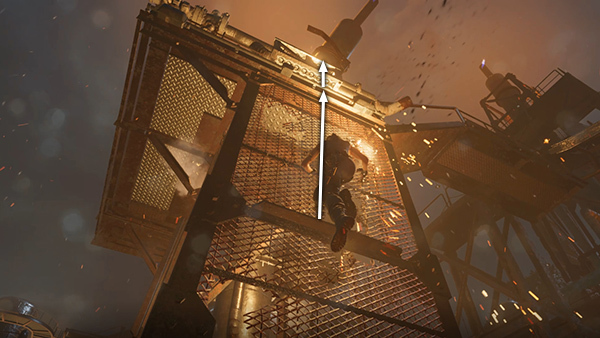 Just as you reach the top, the elevator drops away beneath you. Again, just drama. 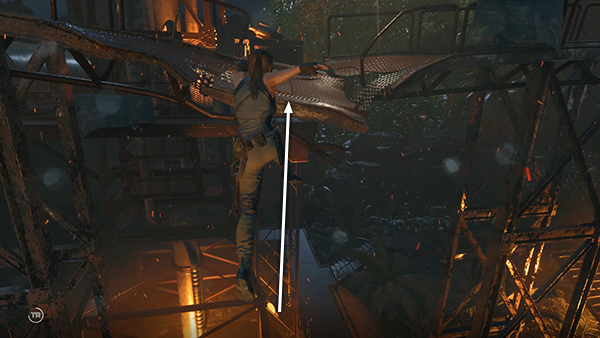 Lara will handily grab the solid beam as long as you double-jump to scramble, as usual. Pull up. 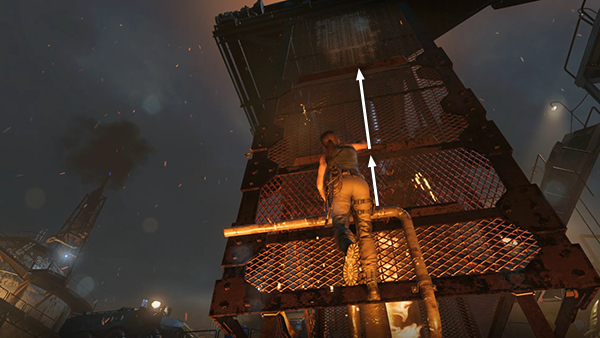 Walk across the diagonal I-beam and jump to grab the dangling ladder. ...up and around the corner to the right. 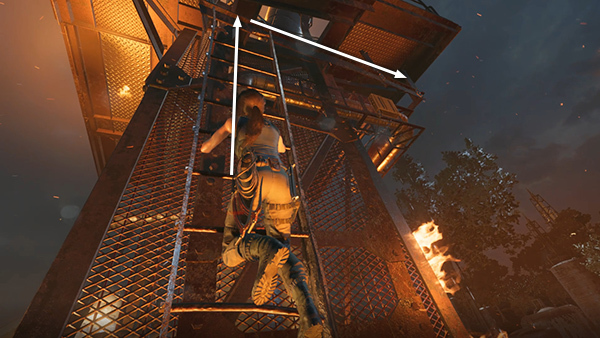 Continue climbing to the right until Lara's feet come up up onto the metal grating. 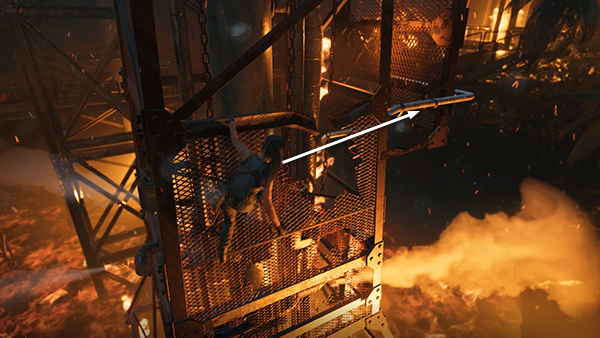 Then jump straight up to grab the railing jutting out from the top of the tower.